This morning it happened again. Last week I updated my kernel through the yast-updater. And this causes me to recompile my VMWare modules using vmware-config.pl. However: the compilation fails. For info I now run: 2.6.25.20-0.1-default x86_64 (Open Suse). The compilation failed with the error: '... In function ‘VNetBridgeUp’: /tmp/vmware-config3/vmnet-only/bridge.c:947: error: implicit declaration of function ‘sock_valbool_flag’ ... '. It took me sometime to get me back to my own earlier post at: http://darwin-it.blogspot.com/2008/11/wireless-network-bridging-with-vmware.html. Here I wrote that I had to add the function in /usr/src/linux/include/net/sock.h. Open the file in vi (as root). Then running vmware-config.pl should succeed. Good luck. And I hope I remember this the next time I update the kernel. This morning I tried to install Subversion 1.5.1 on Red Hat Enterprise Linux 4. This turned out to be a slightly more complicated than just easy. Because I ran into some dependency issues. I downloaded Subversion 1.5.1 at: http://summersoft.fay.ar.us/pub/subversion/1.5.1/rhel-4/i386/. Summerset is one of the suppliers of the subversion binaries. I found that they did quite a good job on providing the necessary libraries for the different Linux flavors. At least the ones I needed. However, although subversion 1.5.1 needed the arp libraries, they were not found in the subversion/1.5.1/rhel-4 folder. So I fetched them from the subversion/1.4.6/rhel-4 folder. So I now start off with creating my repository. I know I'm a little stubborn. Actually I feel that it does not quite fit the Dutch word "eigenwijs", that means something like "know it better". And indeed on contrary to my colleagues I use OpenSuse Linux 64-bit, whereas they stick to 32-bit Windows. If they're happy with it, they should. But since my laptop has 4GB I want to use it all, so I wanted a 64-bit OS. And I want to drive myself in getting used to a unix-a-like OS, I use Linux. I learned all the windows versions from 3.1 to XP/Vista by doing. So the best way to learn an OS or an application for me is just by using it. For reasons that lay in the line of the above, I use Thunderbird for years now (long before I stepped into Linux). And since recently I use Gmail. Now I had a problem. I have a 64-bit Thunderbird, because of my 64-bit Linux. But the Lightning extension that you download at mozilla.com is a 32-bit and thus not fit for my Thunderbird. Therefor I used Sunbird with the Google Calendar Plugin. Yesterday I stumbled upon the lightning plugin in Yast (the packagemanager of OpenSuse). So I installed it. And it worked. Apparently just recently they released a 64-bit Lightning. So I also installed the Google Calendar plug-in. But this reports that it misses modules. Also the Lightning plug-in reports that it is not updatable because of its source. Googling I found the 64-bit Lighting plugin via this blog. Download the file lightning-0.9-linux-x86_64.xpi and install it in Thunderbird. You can find the Google plugin at: https://addons.mozilla.org/en-US/sunbird/addon/4631. Download the add-ons and install them in Thunderbird. Then after restarting the plugins both work. Then copy the link in the pop-up dialog. In Lighting create a new calendar. Choose "on the network" in the first wizard page. Then choose "Google Calendar" on the second wizard page, and paste the link in the location. At the connect dialog provide the correct username/password to your gmail account. You can give in a color and a name in the last wizard page, before you click finish. When you right click on the calendar and choose properties, you can check the "cache" box. This requires a restart of Thunderbird but will cache the events. Mark that adding events to the calendar while not on-line will fail. For that you might want to have a local (on the computer) calendar. Being on-line you can toggle the events to the on-line calendar when updating them. Adding calendars of work-mates or friends is just the same. By default the connect-dialog provides the username of your work-mate/friend. Provide your own credentials and you're done. So thanks Sunbird, but now I have my Calendars right into Thunderbird you're done. I recently wrote about how to enable your wireless network adapter for use as a bridge within VMWare Server 1.0.7. See here. It was not (much) more than a week after the article that VMWare came with VMware Server 1.0.8. Since I just had my wireless working I did not dare to switch. But today I just took the chance. And guess what? The VMWare people did not read my article! Now I have to repair it again. Since there is a solution I figured that they would repair it in 1.0.8. But fortunately I had a copy of my repaired vmnet.tar. I also backupped the original vmnet.tar from the 1.0.7 installment. It turns out that the new vmnet.tar from 1.0.8 is exactly the same in size. I placed my repaired vmnet.tar here. Just place it as root in: /usr/lib/vmware/modules/source and run vmware-config.pl again (as always it is wise to backup your original vmnet.tar). If you then bridge vmnet2 to your wireless lan adapter, and couple one of the ethernet-adapters of your VM to vmnet2 it will work again. And now we hope that VMWare is willing to repair this their selves in the next release. As (probably) every other consultant I don't like the task of documenting my source. It's necessary, but boring. And what do you document and what not? And what if you add a parameter? It would be handy if you can generate your documentation, wouldn't it? 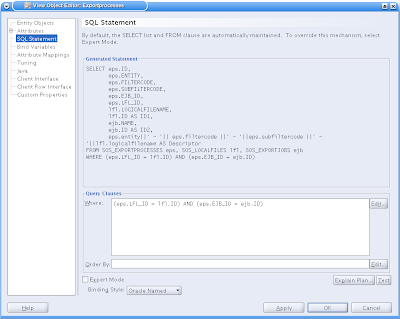 And it can: using the pl/sql doc plug-in of Pl/Sql Developer. Already a few years a I wrote an article on it. For our Dutch readers and our non-dutch readers who are that linguistic that they haven't any problems with our beautiful language, you can download it here. Many consultants that use Windows find that the Taskmanager of windows is pretty rudimentary. Also you might have encountered that files are locked by processes that you're not aware of. Or process that you can't manage to kill using Taskmanager. 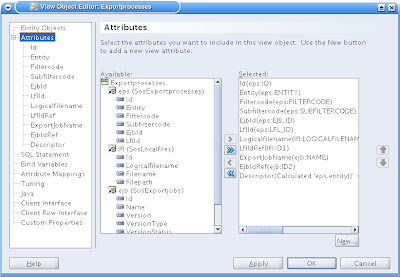 Then the Process explorer tool of Sysinternals is very usefull. Sysinternals is now part of Microsoft (already since a few years) but the tool is still available for free. It is such a great tool that I recommend to replace the taskmanager by it. For our dutch readers I have an article on Process Explorer that I wrote a few years ago. You can download it here. I used to use XMLTypes with xml where I tend to prevent the usage of namespaces. Namespaces make things difficult where they are often unneeded. That is I experienced that it is hard. An expression like '/level1/level2/level3' is much simpeler then '/ns1:level1/ns2:level2/ns3:level3'. Especially if you don't know how to give in the particular namespaces. Lately I wanted to store the results of a BPEL Process in the database to be able to query parts from that in a later process. Actually I processed several files in the one process and wanted to query the statuses in the later process again. If you work with BPEL you cannot avoid using namespaces. I also wanted to put the results in an XMLtype as is, since it prevented me to create a complete datamodel. A simple xmltype-table suffices. I then created a pl/sql function with the filename as a parameter that fetched the right row in the results table and gave back the xmltype column in which the status of that file was stored. 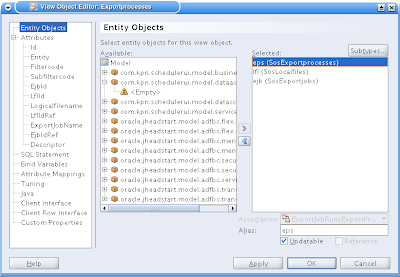 But then, how to query it with XPath? I knew the xmltype.extract() function. But what next? You can avoid namespaces by using the local-name() xpath function, but then it is a little hard to get the value of the particular file. You can have multiple declarations separated by white space. Read more about it on page 4.6 of: http://download-uk.oracle.com/docs/cd/B19306_01/appdev.102/b14259.pdf. Mark also that there are actually two functions: extract() and extractvalue(). Extract() returns an xmltype, that can be 'sub-queried'. 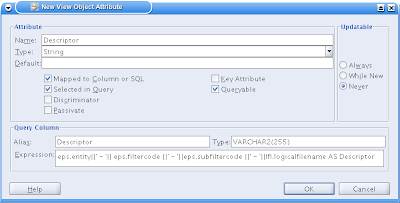 The extractvalue() function returns the datatype of the variable that the value is assigned to. With the xmltype functions getstringval(), getclobval(), etc. you can also get the particular value of a node of the xmltype. However, there is a slight difference between the result of the getstringval() and correspondingfunctions and Extractvalue. And that is that the Extractvalue returns the unescaped value of the node (the encoding entities are unescaped), while getstringval() returns the value with the entity encodings intact .